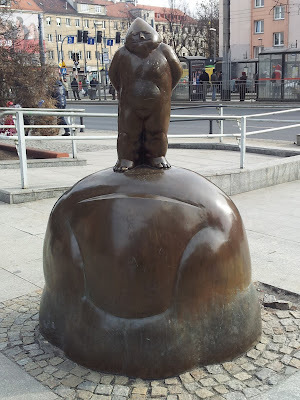 You may have heard of the dwarves or gnomes of Wroclaw if you watch 'Coach Trip'. I remember seeing them in an episode last year, so spending a day seeking them out was near the top of my 'to-do' list while visiting Wroclaw. The locals refer to them as dwarves, but in Britain we would call them gnomes since they very much resemble the little chaps sitting round Grandad's garden pond. Young people may have never heard of them since they're not particularly popular with anyone under the age of 65! 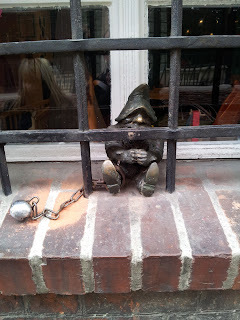 As the guidebook states, 'they [the gnomes] are everywhere in Wroclaw. Like a miniature invading army, they dot the city's doorways, alleys and street corners.' Although the mythical dwarve-like creatures were common in medieval Polish Folklore, the reason for their presence in the city is much more recent. Poland, as you are probably aware, was a communist country and any anti-establishment graffiti or public art was promptly painted over by the militia. A local art history student decided that his underground protest movement, the 'Orange Alternative Movement' would handle political issues in a peaceful way using nonsense and buffoonery to get their message across. They began to repaint over the militia's 'paint jobs' with gnomes, which not only became the symbol of the Orange Alternative Movement, but was favoured by the local community. Gnomes became the mascots of the city, and on Children's day in 1988, dozens of the people of Wroclaw dressed up as gnomes and smurfs. 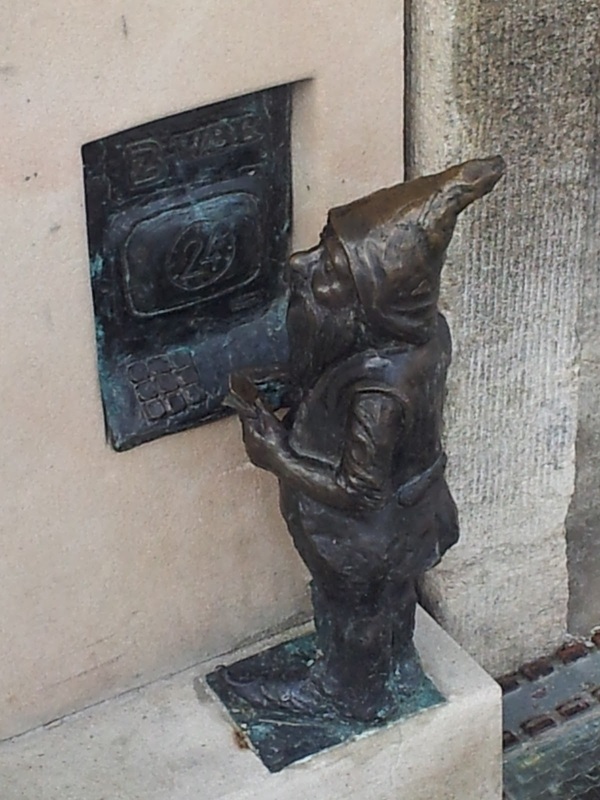 In remembrance of the Orange Alternative Movement, the first gnome, Papa Krasnal, above, was placed where the Orange Alternative Movement used to have their demonstrations. The town council then commissioned a local artist to make five more. He's eaten too much and his trousers have split. Possibly because he's situated outside Pizza Hut! He sits on the front steps of the Church of Mary Magdalene on his motorcycle waving at fellow motorcylists. 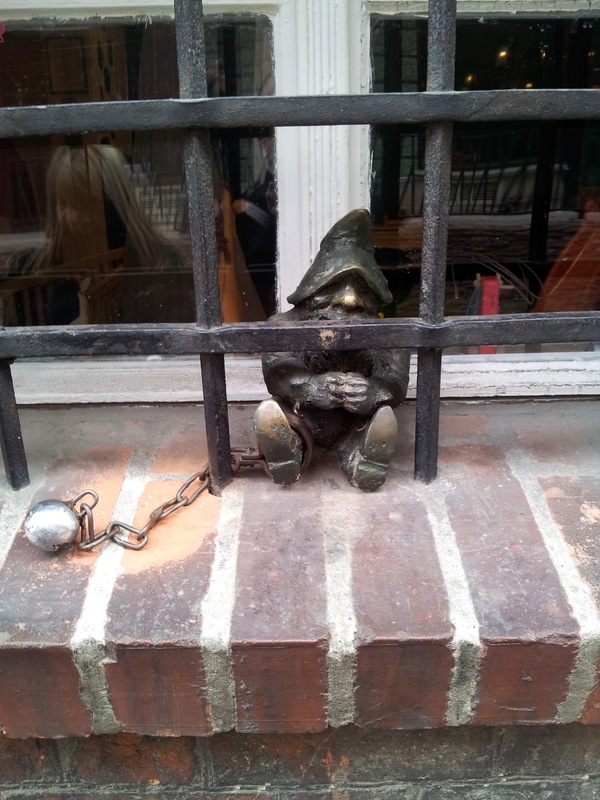 Poor little fellow sits on the window sill outide the old prison, complete with ball and chain. He stands outside the bank waiting for his money.